Most children enjoy participating in school or nursery sponsored trips, but when planning such outings, care must be taken to assure the safety of the kids. There are a number of things to consider when taking groups of children on special trips, but when everything comes together just right, the day can be fun, educational, and memorable for everyone! One of the trickiest parts of planning school trips is deciding on the safest way to get the children from place to place. In urban areas, where the destination may be only a short distance, it may be possible for teachers and parent volunteers to walk along with the kids, keeping a close watch to see that everyone stays together and keeps a safe distance from busy roads or other potential dangers. Young children can be pushed in specially designed strollers, seating multiple children in a line. Most school and nursery outings require motor transport, and safety measures must be a top priority. Some nurseries have their own vehicles, but oftentimes, children are taken by hired buses, driven by professional drivers. Kids should be instructed to be on their best behaviour during all school and nursery trips so that bus drivers can concentrate on the road without any undue distractions. Kids are excitable little people and may not always listen to instruction when they are on outings and day trips. For the sake of safety, it’s vital that there is sufficient adult supervision to assure that all children are being carefully watched. A safe adult to child ratio varies, depending on the ages of the children, but very young kids, especially, need to have responsible adult supervision at all times. When planning trips, parents must be made aware that without their assistance, the outing may have to be cancelled. 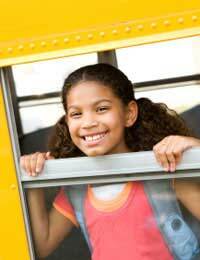 One of the best ways to improve the safety on school trips is to prepare the kids for the experience in advance. Practicing appropriate bus behaviour, talking about the importance of staying together, and giving kids instruction about what they should do if they become separated from the group can all help to keep children safe on outings. All children should carry emergency identification information with them when they are on school trips, including the child’s name, as well as the telephone numbers of both the school and the child’s parents. While chaperones will do all that they can to keep the children safe and close at hand, kids sometimes wander off and may not yet know their full names or the names and phone numbers of their schools or nurseries. Before taking children on even short trips, schools and nurseries should secure written permission from each child’s parents of legal guardians. Additionally, it is important that the nursery carry proper insurance so that they are covered in the event of any mishap. Bus companies will carry their own insurance, but it is up to those planning trips for children to double check the qualifications of those who they are entrusting to transport the children in their care. Bus company safety records should be made available to schools and nurseries, and all drivers should have undergone proper background checks before being allowed to get behind the wheel of a vehicle that will be used to transport kids. School and nursery trips are both fun and educational, but safety matters a great deal. Kids don’t yet have the common sense to recognise all of the potential dangers in the world, so teachers, nursery workers, and other adult chaperones must be alert and aware of the children’s activities all throughout the day.